Nine Lives Racing: Holley HP EFI 5.7" touch screen/ The New Dashboard. Holley 5.7” touch screen will take the place of your computer. I also found out it will replace your gauges too! 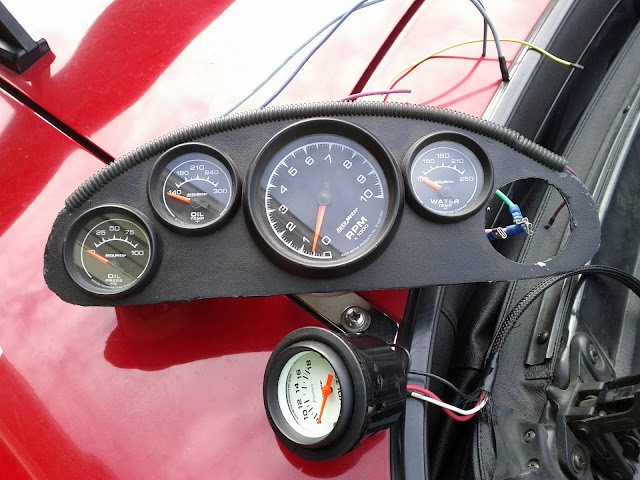 Here is my standard Miata/Autometer gauges they served me well for quite some time. Here they are pulled out. I had to keep the gas gauge. It’s the only parameter that is not monitored by the ecu. It can read fuel pressure, but that only lets me know when I’m out of gas. With no fuel pressure I think the sitting on the side of the road will be just as useful for reading my gas pressure. I’m ranting… sorry onward! I grabbed a 6x12 piece of aluminum, bolted the EFI screen to it. I also put in my wide band. I didn't need to because the touch screen has a wideband displayed, but I didn't want the dash to look “lopsided”. It was a 4 wire installation, constant 12V, ignition 12v, ground and a CANBUS wire to the ecu. You can see the digital sweeping style tack. That I think is way awesome, and every little gauge function is changeable. If there is a parameter that the ecu receives then that can be programmed by a touch. You can change the display to several different screens. The fist screen is incredibly bright, Bright enough to stand up to direct sunlight. Being that my car is a convertible that is important. I flip to the display above for driving at night, it’s a little darker. 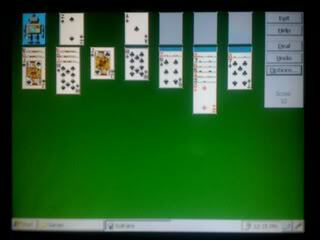 The guys over at Holley Forums found out you can play solitaire on it. They say if you get stuck at a greased down track, you can kill some time. It’s a sweet accessory. At the fly I can swap between a high octane and an e85 tune. If you’r build is from the ground up this screen is simple choice. Get it! It takes the place of $500 worth of Autometer gauges and $200 worth of a crappy Toshiba. well worth the cost. I am giving the complete Holley Dominator setup a hard look. That screen showing the analog type gauges I like a lot. That would really clean up the dash. I'm curious to know more about the different options on this display. Especially if that specific display can have multiple screens showing different parameters. You have only one physical screen but you have your choice when it come to the display. All the parameters you see on my screen are adjustable. You can even chose the analog screen and then every "gauge" is able to display a user selected parameter. I use mine to adjust the tune between maps. There are websites that allows you to market your local deals, coupons, auto promo codes and promotions very easily. Just create a deal that your customers are looking for and post your valued offer, it's that easy!